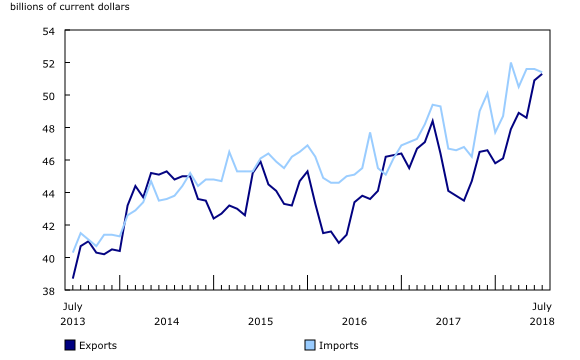 Canada's merchandise trade deficit with the world narrowed from $743 million in June to $114 million in July, the smallest deficit since the most recent surplus in December 2016. Total exports rose 0.8%, mainly on higher crude oil prices. Total imports declined 0.4%, due to fewer aircraft imports. In real (or volume) terms, exports were down 0.8%. Export prices rose 1.6%, and were behind the export gain in nominal terms. This price increase was primarily attributable to higher prices of energy products. Total import volumes fell 1.1% in July, and prices were up 0.7%. Exports rose 0.8% in July to a record $51.3 billion, despite declines in 6 of 11 product sections. Increased exports of energy products and motor vehicles and parts were partially offset by lower exports of aircraft and other transportation equipment and parts. Year over year, total exports rose sharply (+16.3%). Month over month, exports excluding energy products edged down 0.2% in July. Exports of energy products rose 5.0% to $10.3 billion, the highest level since September 2014. Crude oil exports (+7.0%) were responsible for the increase in July, with prices rising 9.4% and volumes falling 2.2%. Crude oil exports have more than doubled over the past two years, and July marked the fifth consecutive monthly increase. Exports of motor vehicles and parts increased by 3.4% in July to $8.0 billion, primarily on the strength of higher exports of passenger cars and light trucks (+3.8%). This year, planned closures in the automotive manufacturing industry in July were fewer and shorter compared with a year earlier. For the section as a whole, exports rose 5.9% compared with July 2017, but were 6.7% lower than in July 2016. Imports declined 0.4% to $51.4 billion in July, with 7 of 11 product sections decreasing. Lower imports of aircraft and other transportation equipment and parts, and of metal ores and non-metallic minerals, were partially offset by higher imports of energy products. Year over year, total imports rose 10.1%. Imports of aircraft and other transportation equipment and parts fell 15.6% to $1.8 billion in July, following a 14.1% decrease in June. Aircraft (-44.8%) led the decline in July, mainly due to lower imports of airliners from the United States. Following a 15.8% increase in June, imports of metal ores and non-metallic minerals fell 13.9% in July to $1.2 billion. The decline in imports was led by other metal ores and concentrates, which fell 16.7% due to decreased imports of gold bullion from Japan and of gold doré from Brazil and the Dominican Republic. These decreases were partially offset by an 8.8% increase in imports of energy products, following a 13.4% decline in June. Refined petroleum energy products (+11.3%) and crude oil (+7.4%) contributed the most to the increase in July, primarily on higher prices. Overall for the section, prices were up 5.2% and volumes increased 3.4%. Exports to the United States rose 3.3% to $38.4 billion in July, and increased 15.8% on a year-over-year basis. Imports from the United States edged down 0.1% to $33.1 billion in July. Consequently, Canada's trade surplus with the United States widened from $4.1 billion in June to $5.3 billion in July. This represents the largest trade surplus observed since October 2008. 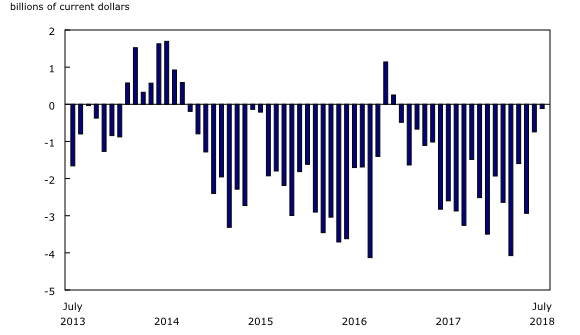 For the year to date through July, Canada's merchandise trade surplus with the United States was $24.2 billion, while it totalled $25.6 billion for the same period in 2017. After reaching a record high in June, exports to countries other than the United States fell 6.0% to $12.8 billion. Several countries contributed to the decline in July, including Japan, Germany, Mexico, India and Saudi Arabia. These decreases were partially offset by higher exports to the United Kingdom (crude oil and unwrought gold). Imports from countries other than the United States fell 1.0% to $18.3 billion in July. Lower imports from Belgium (pharmaceutical and medicinal products), Japan (various products) and Saudi Arabia (crude oil) were mainly behind this decline. Consequently, Canada's trade deficit with countries other than the United States widened from $4.8 billion in June to $5.5 billion in July. 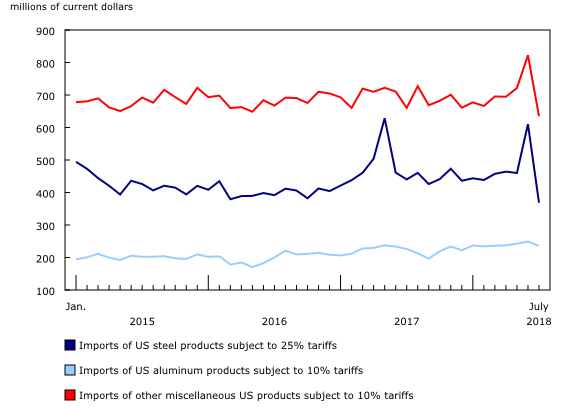 July marked the second consecutive month in which tariffs were applied to exports of steel and aluminum products to the United States. It was also the first month in which tariffs were imposed on imports of steel, aluminum and other miscellaneous products from the United States. Seasonally adjusted data on exports and imports of newly tariffed products for July are now available. On a customs seasonally adjusted basis, exports of steel products to the United States that were subject to a 25% tariff rose 16.4% in July. This increase follows a 36.3% decline in June. Steel exports were up 3.2% compared with July 2017. Aluminum exports subject to a 10% customs tariff fell 2.0% in July. This follows a 4.7% decline in June. Year over year, aluminum exports were up 8.1%. Imports of steel products from the United States subject to a 25% tariff fell 39.6% in July, on a customs seasonally adjusted basis. This follows a 32.7% increase in June. Year over year, imports of these products decreased 16.3%. 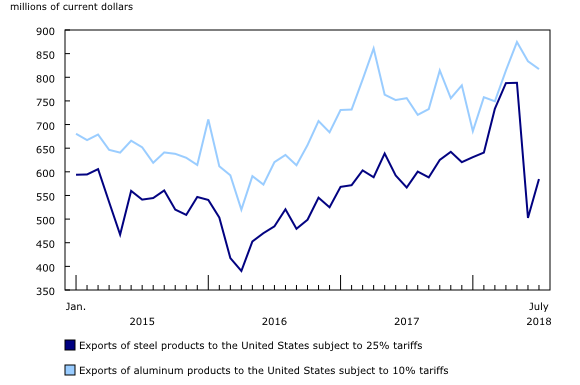 Aluminum product imports subject to a 10% tariff fell 5.2% in July. Compared with July 2017, aluminum imports were up 4.3%. Imports of other miscellaneous products also subject to a 10% customs tariff fell 22.8% in July, after rising 23.4% from February to June. Year over year, imports of these products were down 3.9%. Revisions reflect initial estimates being updated with or replaced by administrative and survey data as they become available, as well as amendments made for late documentation of high-value transactions. Exports in June, originally reported as $50.7 billion in last month's release, were revised to $50.9 billion in the current month's release. June imports, originally reported as $51.3 billion in last month's release, were revised to $51.6 billion. Since the beginning of 2018, the average monthly revision to Canada's trade balance in the subsequent month is $115 million. Statistics Canada is updating the North American Product Classification System (NAPCS) Canada for merchandise import and export statistics. The NAPCS 2017 version will replace the NAPCS 2007 version, which is currently in use. Revised data based on NAPCS 2017 for the reference period of January 1988 to December 2014 will be disseminated on November 21, 2018. The first regular release based on NAPCS 2017 will occur on December 6, 2018, and will include data covering the reference period from January 2015 to October 2018. Real-time table 12-10-0089-01 will be updated on September 17. Data on Canadian international merchandise trade for August will be released on October 5.